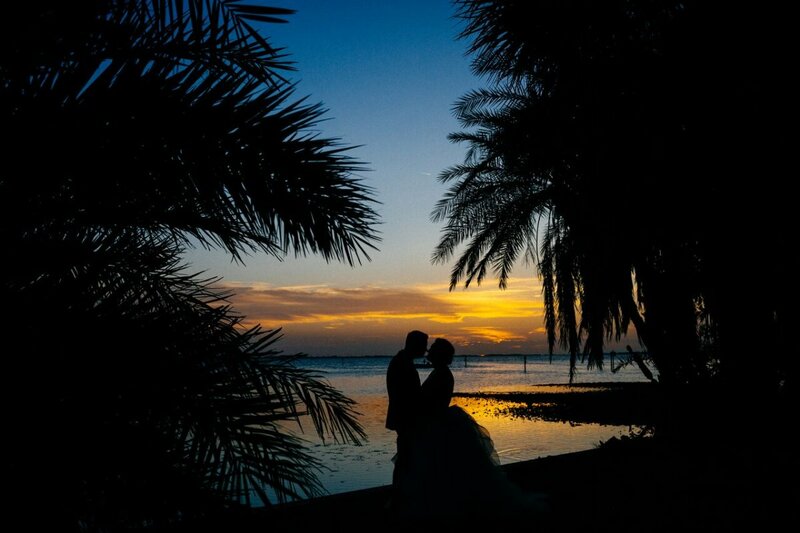 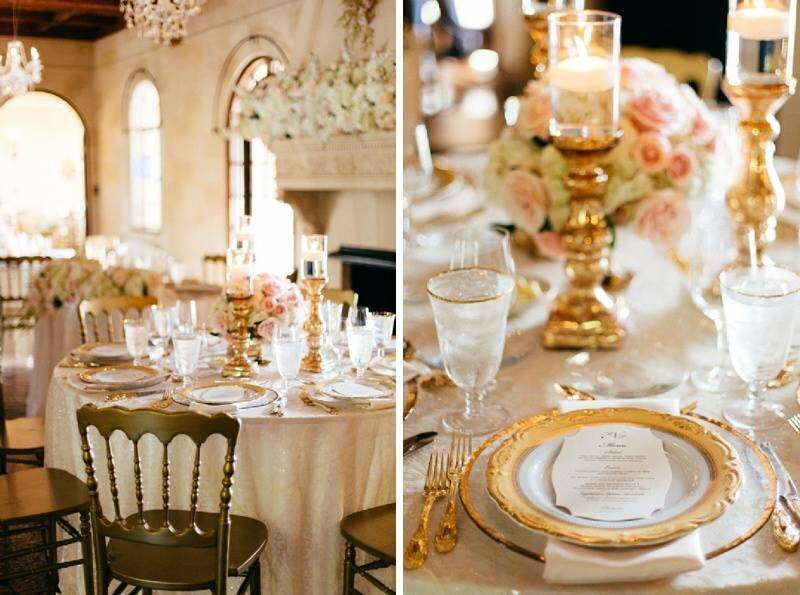 “WOW” should be the first word that comes to mind when you see THIS wedding. 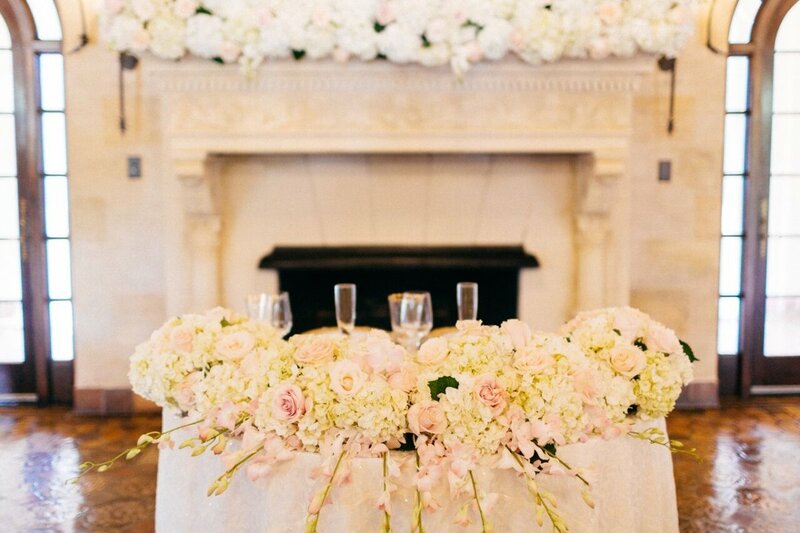 The flowers were lush, opulent, and absolutely everywhere in this gorgeous wedding that took place at the beautiful Powel Crosley Estate. 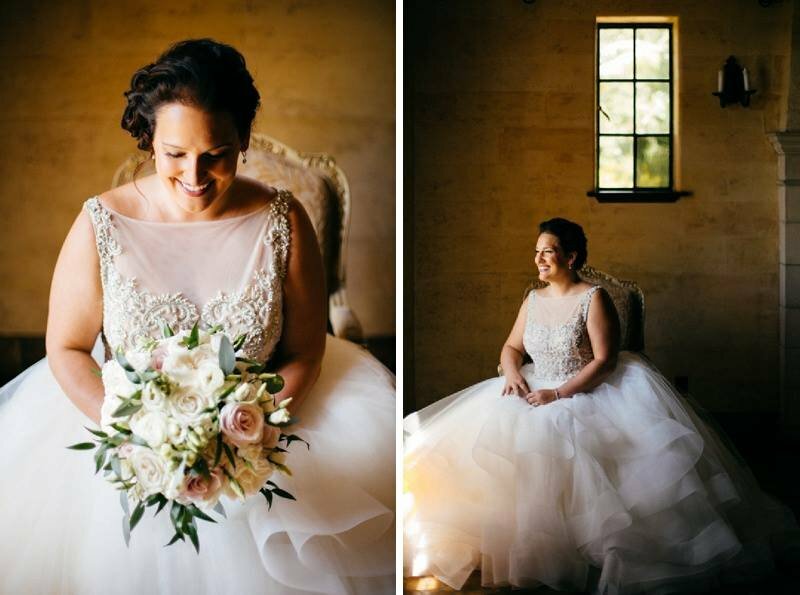 This bride was looking for an uber -luxurious look with elegance and sophistication at every turn! 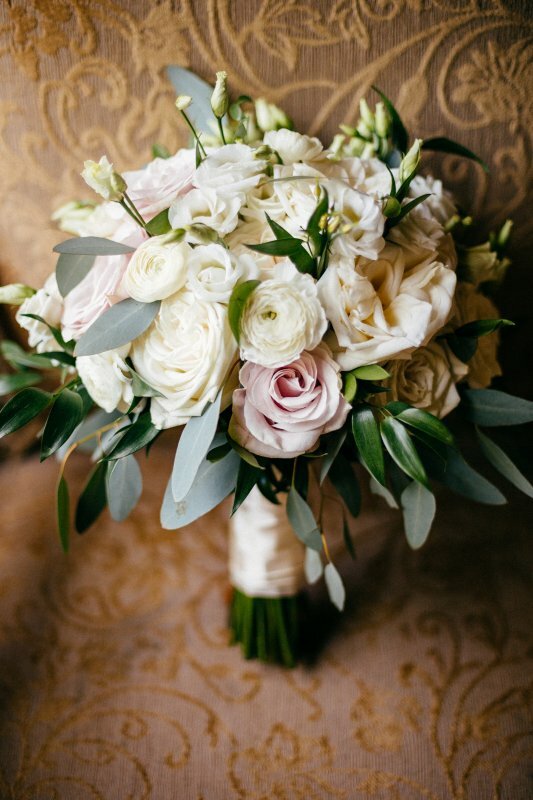 The bride carried a lovely hand-tied garden bouquet that was filled with O’Hara, Playa Blanca, and pink Mondial roses plus white lisianthus and ranunculus with touches of Italian ruscus and silver dollar eucalyptus. 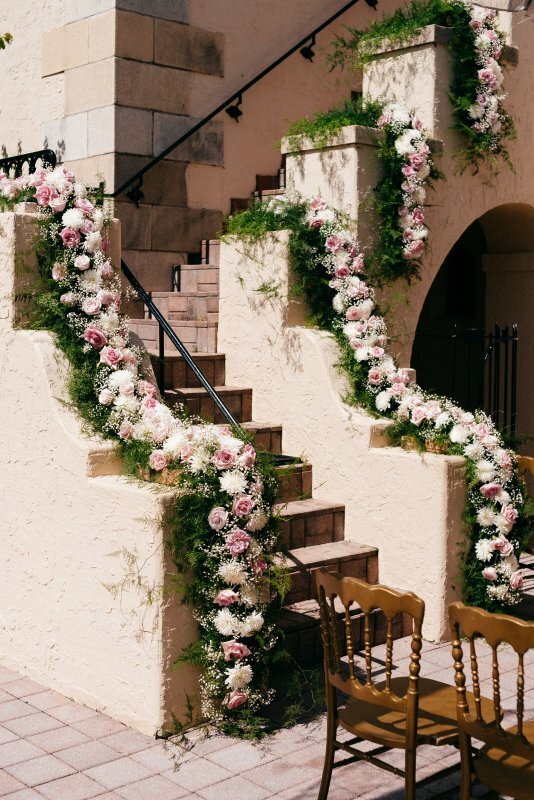 The bridesmaids carried bouquets of Playa Blanca and pink Mondial roses with the same greenery. 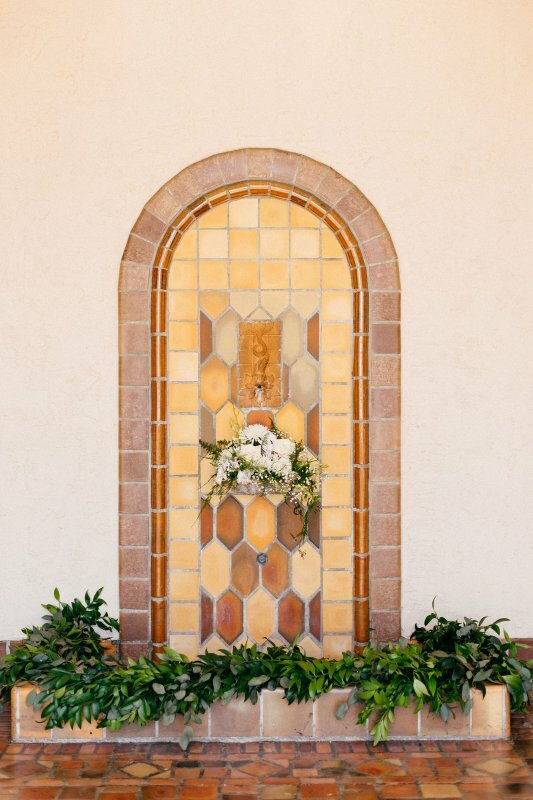 And the groom wore a double ranunculus for for his boutonniere which complemented the bride’s bouquet. 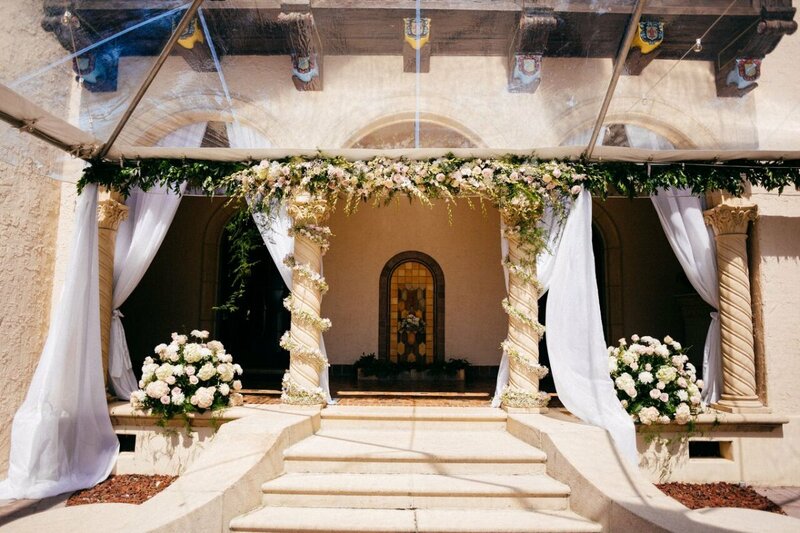 The ceremony site was decorated from top to bottom with stunning flowers everywhere you looked! 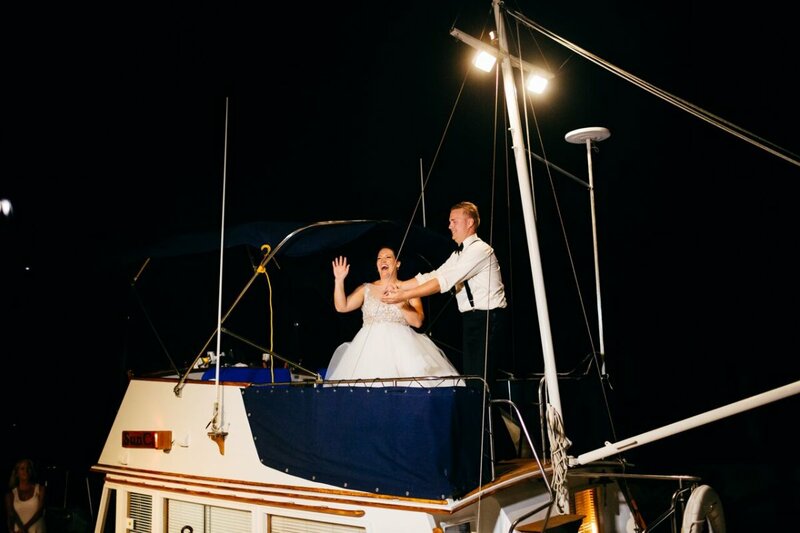 A clear tent was set-up to protect the setting from the elements, but it ended up not being needed, which we were extremely grateful for! 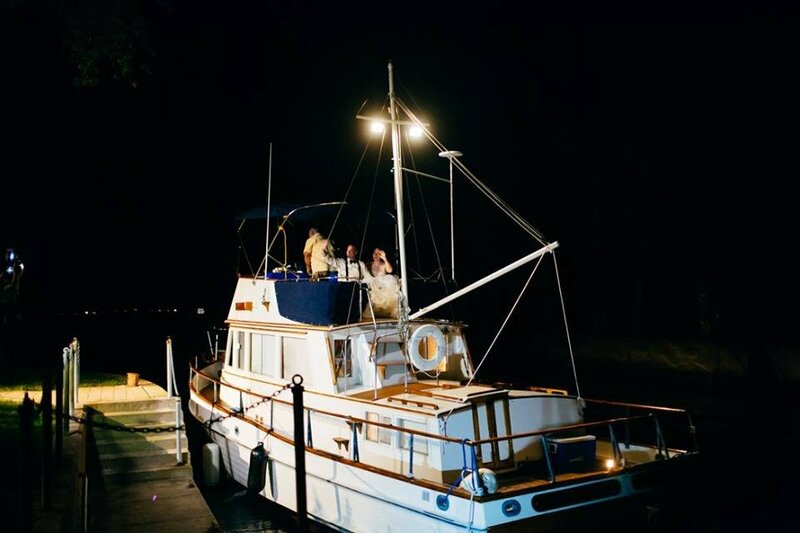 It did, however, make it so that we had to make last-minute adjustments to the ceremony site. 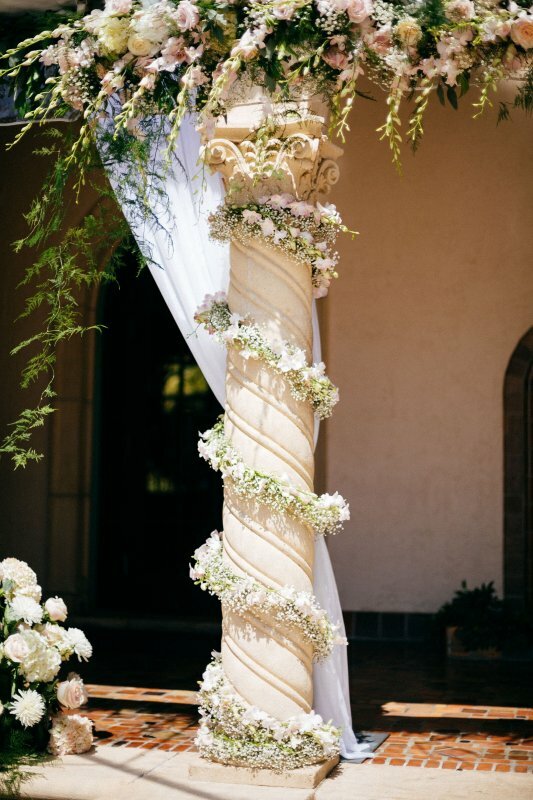 Instead of using flowers in the upper arch over the steps, we did a a pretty garland along the front of the tent edge and worked flowers into it. 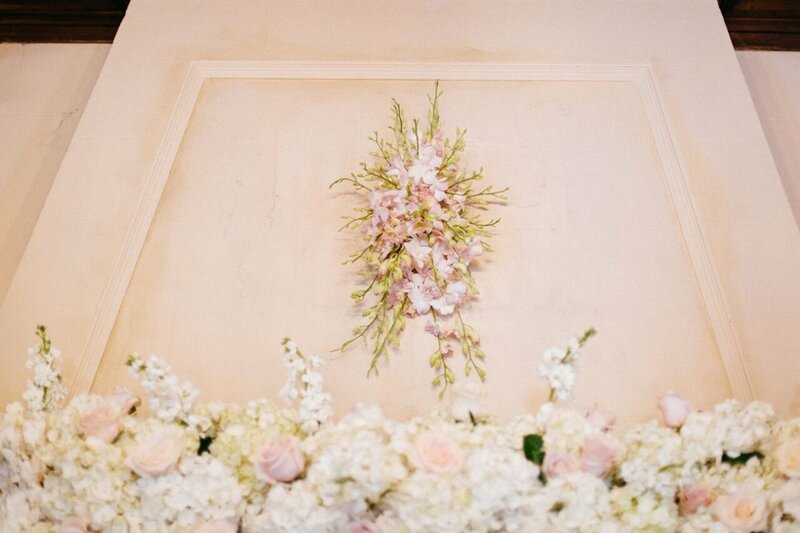 We also added garland of baby’s breath with Marco Polo orchids in blush to the columns that framed the couple. 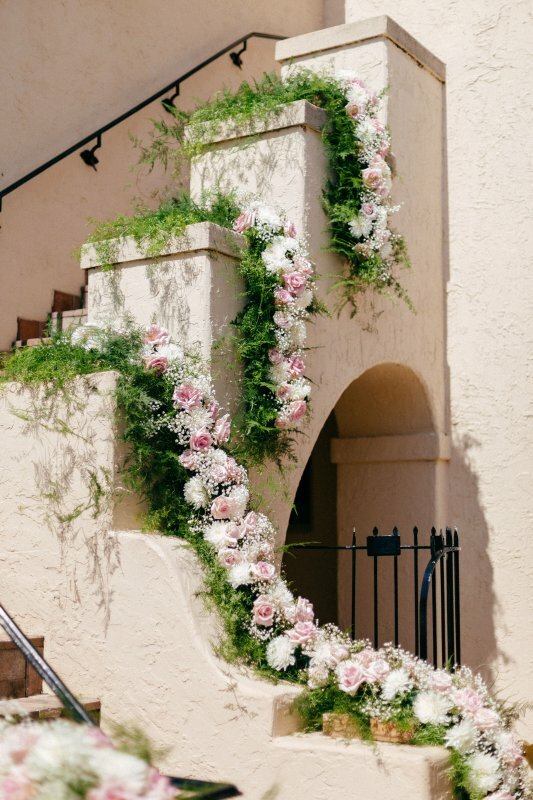 Later the couple entered down the stairway for their first dance that had been decorated with lush and rich trailing floral garlands—it was beautiful and gave the area a real “wow” factor! 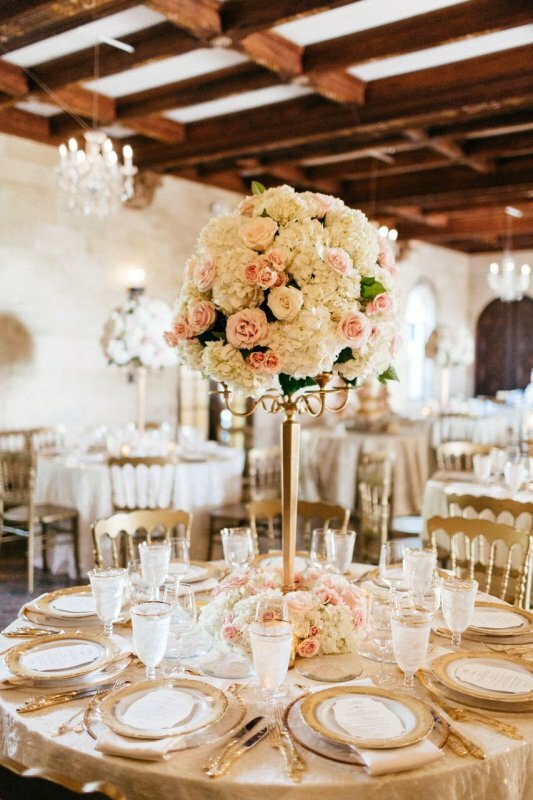 Cocktails were in the pretty pavilion where the guests found their place cards attached to charming small champagne bottles at the base of a large lovely urn filled with hydrangea and roses. 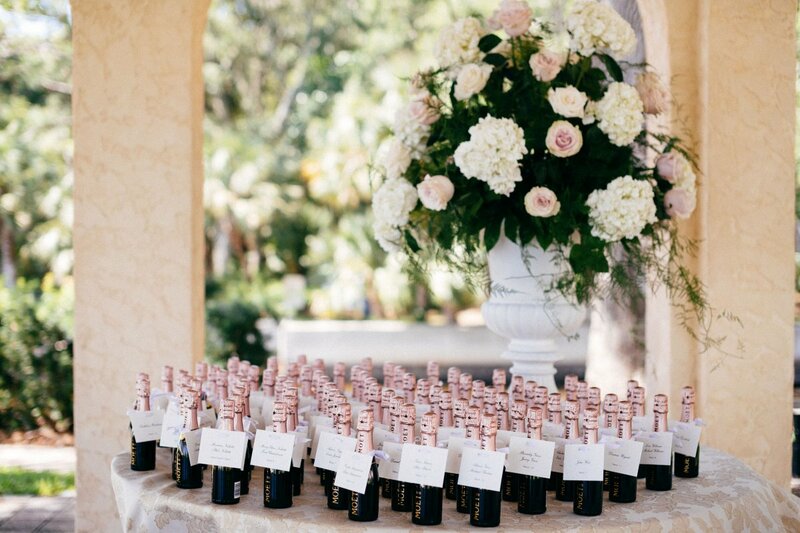 The idea of the sweet little champagne bottles was extremely clever as it is so hard to use place cards outside as there is always a breeze! 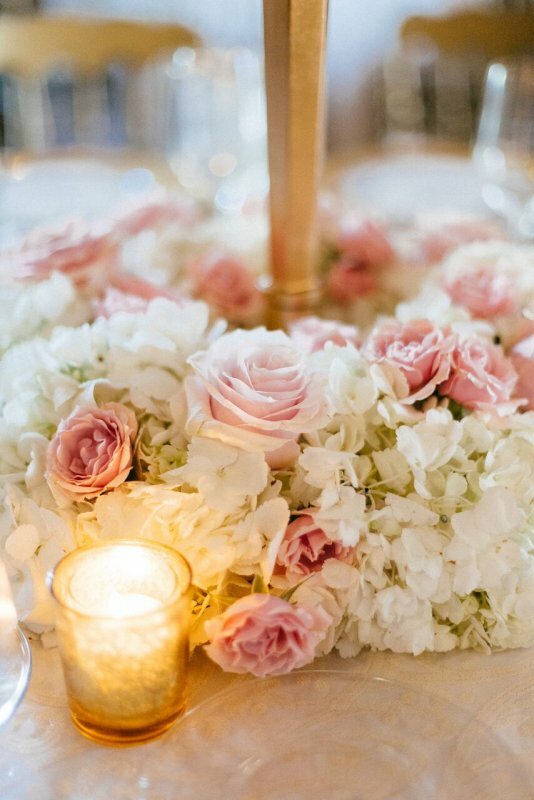 Dinner was held inside and the couple had a sweetheart table in front of the mantle, which were both edged with blush and cream flowers of roses, orchids, and hydrangea. 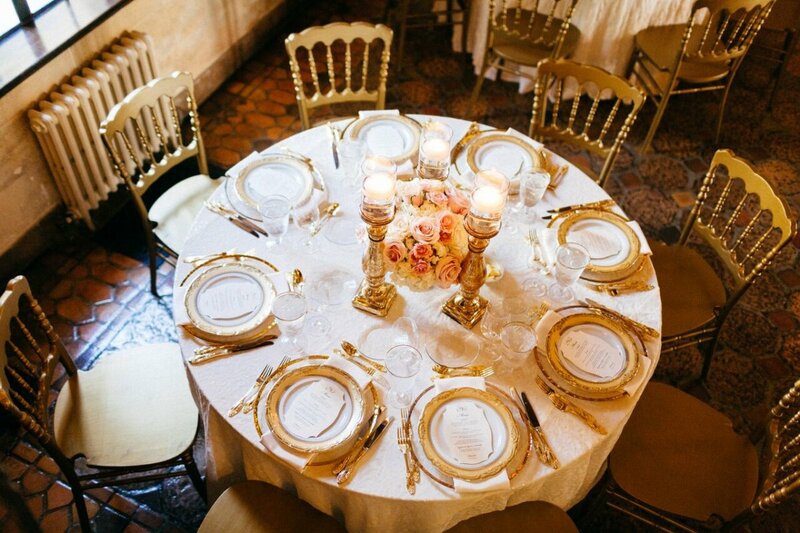 It had a rich and sophisticated look. 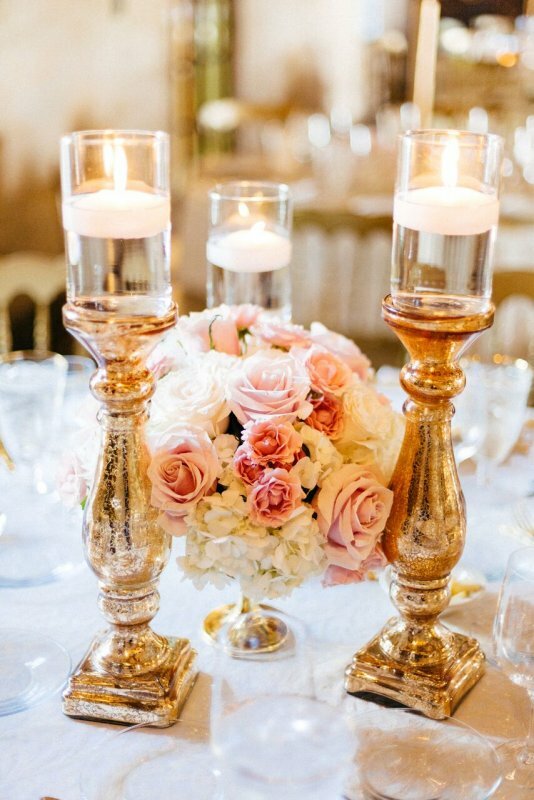 The guests tables had either a tall gold candelabra topped with a topiary-like arrangement and a wreath of flowers at the foot of the candelabra or low arrangements with similar flowers in low gold mercury-footed bowls surrounded by 3 gold pillar candle holders with cylinders of floating candles. 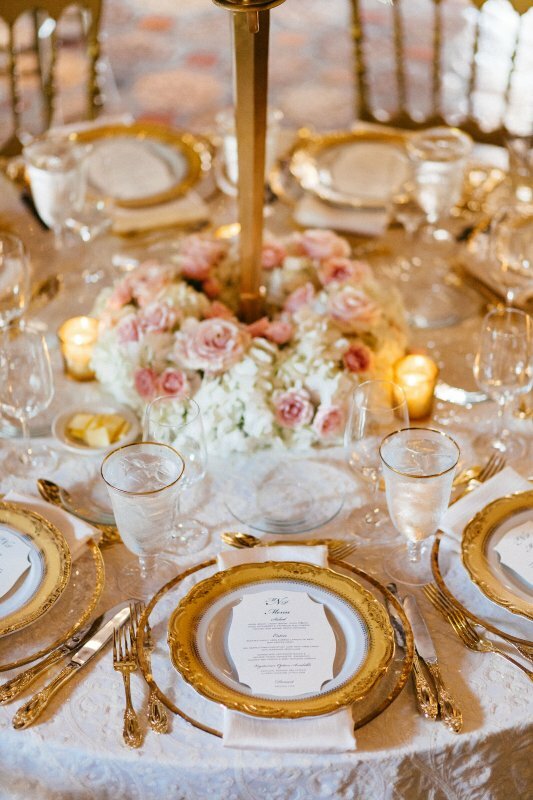 These centerpieces were super luxurious and romantic and the gold took it to the next level! 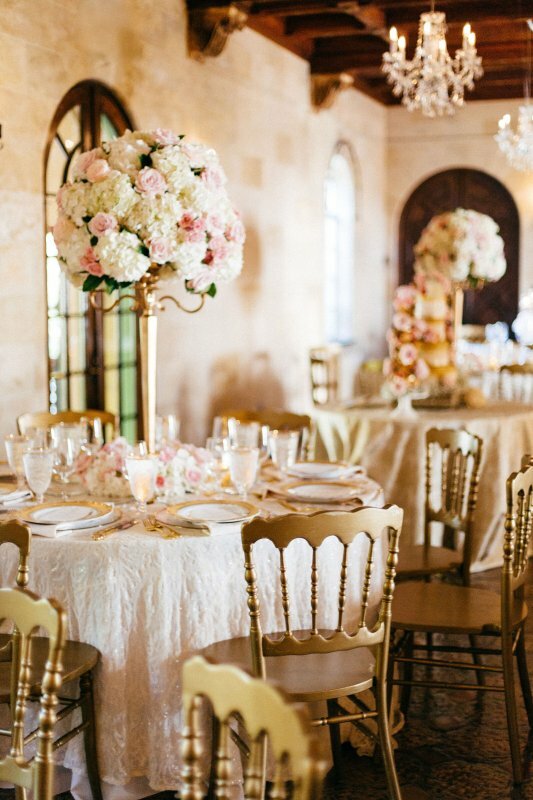 The cake table was a wonder with a gorgeous main cake painted with gold and adorned with flowers and gold leaves and side cakes of macaroons and pink mondial garden roses with gold leaves, so so pretty!